My January Box from Knoshy is Here! The box actually arrived a few days ago … they aren’t running late, I am! I know that every month I write out my gushing praise of this company, but, trust me, the gushing praise is well deserved. I love Knoshy! This month’s box was crafted with health in mind – starting the new year off right with healthy snacks! It would seem that “healthy snacks” seems to be a similar theme with my two boxes that I received this month, but, that’s OK. However, I would have probably been more thrilled with a tea time box (January IS hot tea month, you know!) Then again … I’d be thrilled with a tea time box any time. Ha! I can’t wait to start knoshing on these boxes! My Goodies Box for May! Posted: July 3, 2013 in Goodies Co.
And it arrived in a timely manner too! I was happy about that … it would seem that Goodies is getting into the groove! And there were some tasty items to be found in May’s Goodies Box! First of all, there was a coupon for a free package of Wholly Guacamole, and as I’ve professed in this review, I love this stuff! Since Wholly Guacamole has to be refrigerated, it makes sense to send us a coupon for a free package rather than sending us a package of it … it would have spoiled on the journey. Also included was a “chip clip” from Wholly Guacamole. A nice freebie gift. Also in this month’s box were two packages of Sour Power Straws which are a gummy-like candy. I am not all that in to sour candy, so, I passed these along to my eleven year old daughter, and she enjoyed them. There was a small pouch of SuperSeedz Sea Salt flavored Pumpkin Seeds and I enjoyed these. SuperSeedz has some really intriguing flavors of Pumpkin seeds, including Cocoa and Tomato Italiano … and I’d really love to try some of the other flavors. The sea salt was tasty, certainly, but rather ordinary when compared to some of these other unique flavors. 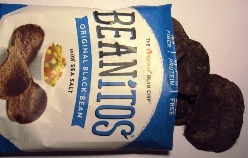 The Beanitos Black Bean chips (again, sea salt flavored) were yummy, I really enjoyed these. Imagine corn tortilla chips that were dipped in black bean dip … then take out the corn and add a little bit of rice … and you have these chips! Nice, crunchy texture with just the right amount of salt. With these chips, I didn’t mind so much that they were the “original” sea salted flavor, because it allowed me to really experience the flavor of the black bean and the hint of rice. These have definitely piqued my interest and I’d like to try some of the other flavors from Beanitos. Also in May’s Box was a teabag pouch of Numi Moroccan Mint Herbal Tea (watch for the review of this tea on SororiTea Sisters), large carton of Zico Coconut Water (Yes! ), two small sampler packets of California Olive Ranch Olive Oil, and a small jar of Bronco Bob’s Roasted Mango Chipotle Sauce … I haven’t tried these yet, so watch for individual reviews of them … the Olive Oil and the Sauce will probably come along with some sort of recipe … I haven’t decided how that will go just yet though! A really good box … I’m happy with it!